2 • November 2018 • S I G N & D I G I T A L G R A P H I C S N O V E M B E R 2 0 1 8 - V O L U M E 3 3 , N O . 2 Contents 6 The Long View Do you really have to think about this? (Yes) By Ken Mergentime 8 In the Trenches Signs, scissors & boney fingers By Rick Williams 64 Chat with Matt An interview with Randy Suchon and Jamie Tarver By Matt Dixon ELECTRIC SIGNAGE Covering advances in illuminated signage, including electronic displays, message centers, channel letters and more. 14 Driving Lessons Choosing the right LED drivers By Ryan Fugler ARCHITECTURAL, ENVIRONMENTAL AND DISPLAY Covering dimensional lettering, routing, sandblasting, engrav- ing and fabrication for architectural signage, wayfinding, ADA, temporary signage systems for P.O.P, retail, display, banners, trade shows and more. 18 Shop Talk Wordy wall job is fun with a laser By Rick Williams 24 Streamlining Outdoor Wayfinding How to choose the right system and manage installation By Amanda McGrory-Dixon RUNNING THE BUSINESS Covering sign industry trends, legal issues, finances, sales, marketing, sign codes, shop maintenance and more. 28 Make it Your Business Business lessons from my Italian mother By Vince DiCecco 31 Building Your Impressions More than signs By Scott Franko PRINTING AND FINISHING Covering the latest in digital printing, media, ink and finishing for banners, backlits, graphics and more. 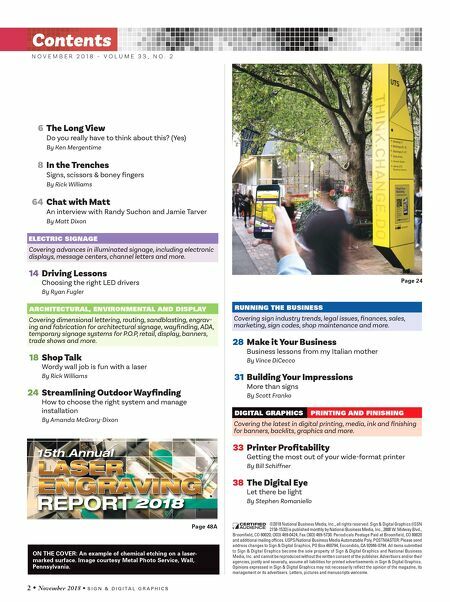 33 Printer Profitability Getting the most out of your wide-format printer By Bill Schiffner 38 The Digital Eye Let there be light By Stephen Romaniello ©2018 National Business Media, Inc., all rights reserved. 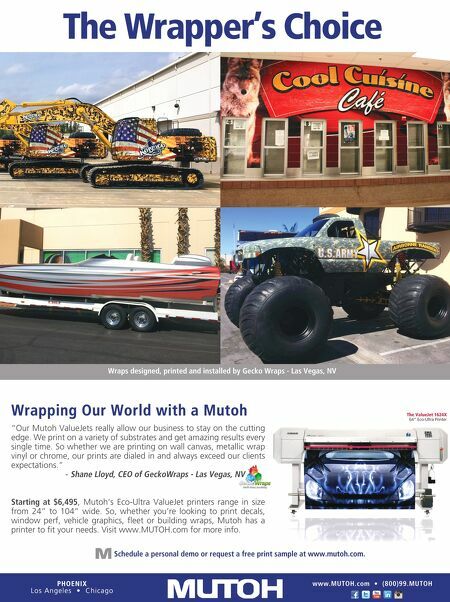 Sign & Digital Graphics (ISSN 2158-1533) is published monthly by National Business Media, Inc., 2800 W. Midway Blvd., Broomfield, CO 80020; (303) 469-0424, Fax (303) 469-5730. Periodicals Postage Paid at Broomfield, CO 80020 and additional mailing offices. USPS/National Business Media Automatable Poly. POSTMASTER: Please send address changes to Sign & Digital Graphics, PO Box 460794, Escondido, CA 92046-0794. All items submitted to Sign & Digital Graphics become the sole property of Sign & Digital Graphics and National Business Media, Inc. and cannot be reproduced without the written consent of the publisher. Advertisers and/or their agencies, jointly and severally, assume all liabilities for printed advertisements in Sign & Digital Graphics. Opinions expressed in Sign & Digital Graphics may not necessarily reflect the opinion of the magazine, its management or its advertisers. Letters, pictures and manuscripts welcome. Page 24 DIGITAL GRAPHICSL Page 48A ON THE COVER: An example of chemical etching on a laser- marked surface. Image courtesy Metal Photo Service, Wall, Pennsylvania.